The 2nd Bite of Bacon! The Long Journey To Paperback!!! My publisher, Plum Tree Books, writes a bit about the process of bringing a book out into the world. Writing may be solitary, but publication takes a village. Thanks to everyone who helped, and thank you to everyone who helps the book continue its journey. It is HERE! 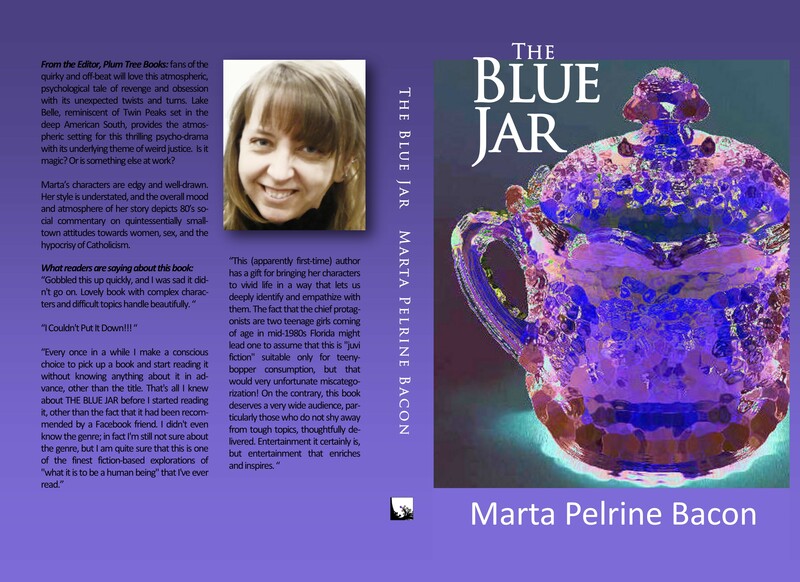 The paperback version of Marta Pelrine-Bacon’s Book: The Blue Jar! Marta has always wanted to hold her book in print. Well! Now, she is. And even if I must say so myself, I am delighted not only with Marta’s great story, but with the book’s velvety look and feel! We all know how much work goes into the writing of a book. But do we know how much work does into its production? Writing is the first stage, but then comes the rest: the editing process, which is exhausting for the author and exhaustive for the editor!